If you’re an emergency, construction, parking enforcement, or public service professional, then you’ll need a rooftop-mountable full-size LED roof light bar that’s large and powerful enough to optimize the visibility of your vehicle on-the-job. 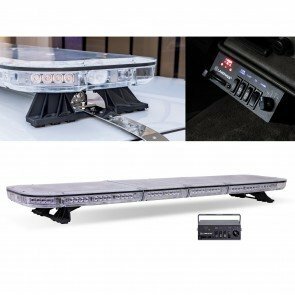 Our full-size LED warning light bars come in a multitude of sizes, LED colors, power output, and technical features designed for specific applications. From 37” to 65” full-size light bars, you’ll find only the most durable, feature-rich, and professional-grade full-size LED emergency vehicle light bars at Online-LED-Store.